For some of us planning our next getaway is the first exciting step towards our next destination. Often we will have customer’s book in advance so they have a sense of direction on where they will be travelling to next and give themselves plenty of time to plan smaller details of their trip. 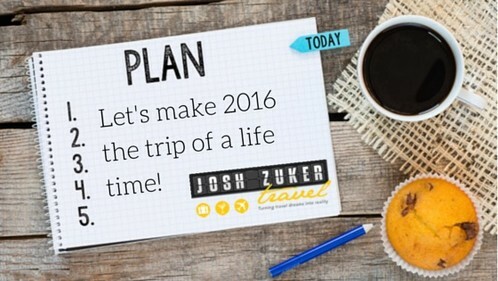 Josh Zuker Travel shared this experience with Natalie Martin, being the first client to book a get away in 2016. Natalie said the main reason she booked early was to be super organised and to balance her work life. “I am a very structured person and like to have things in order and do a lot of research and make decisions based on thorough analysis,” Natalie said. As part of our service we are happy to accommodate clients wanting more time to plan the smaller details of their trip and by booking for 2016 today you can be sure to have your trip designed exactly as you are after. Another thing to remember is that by giving yourself time to plan you can allow your travel agent to help you with other ideas and places to see. Having a less structured plan of what your dream holiday can be beneficial and even make your holiday into something you could never have imagined. So are you ready to book in your next trip? Talk to Josh about 2016 today on 1300 761 901. Keep in touch with us and stay tuned for more blogs from Dani each fortnight.